Last fall I noticed numerous liberal Democrats posting about the plight of children in Syria; which was fair enough. They cried, "Why don't we do something? ", which wasn't. When I asked them what they thought "we" could do about it, some had no idea, others wanted the US to intervene militarily; which would kill and injure many more Syrian children, but that didn't bother them because we've got to do something. (Some people actually said that.) Only America, God's anointed nation, can kill the little children, because we do it in a spirit of love! Next I asked them about the dying children of Yemen, a catastrophe directly aided by the US; the US could do something by cutting off military aid to the Saudi "coalition," and by putting other kinds of pressure on our client. (Syria is not our client.) Of course thinking about this would mean acknowledging then-President Obama's share of responsibility for the horror, so I wasn't surprised that none of them ever took up the cause of Yemen, even to post memes about it. As far as I recall, almost none of them even replied to my comments. Yet even now, when Trump's the official Satan and it's safe to attack his policies and actions, Democratic liberals are stiill silent about Yemen. (They've also fallen silent about the poor children of Syria, which I think sheds some light on how much they ever really cared about them.) If you want to know why many people don't trust, let alone esteem liberals as they esteem themselves, this is one reason why. Someone I know posted this meme to Facebook the other day. The best part of it, of course, is the irony of someone bitching about social media on social media, denouncing those who won't look up from their screens while keeping her eye glued to the screen to search for memes to show how woke she is. You can never go wrong attacking Kids Today for real or fancied Internet abuse; it goes viral even after it's been debunked -- and who makes it go viral? People with smartphones, of course. Old people with smartphones. A close second is that the supposed Orwell quotation is not actually by Orwell. According to Snopes, it's cobbled together from some passages in Nineteen Eighty-Four for a 2017 stage version of the novel. 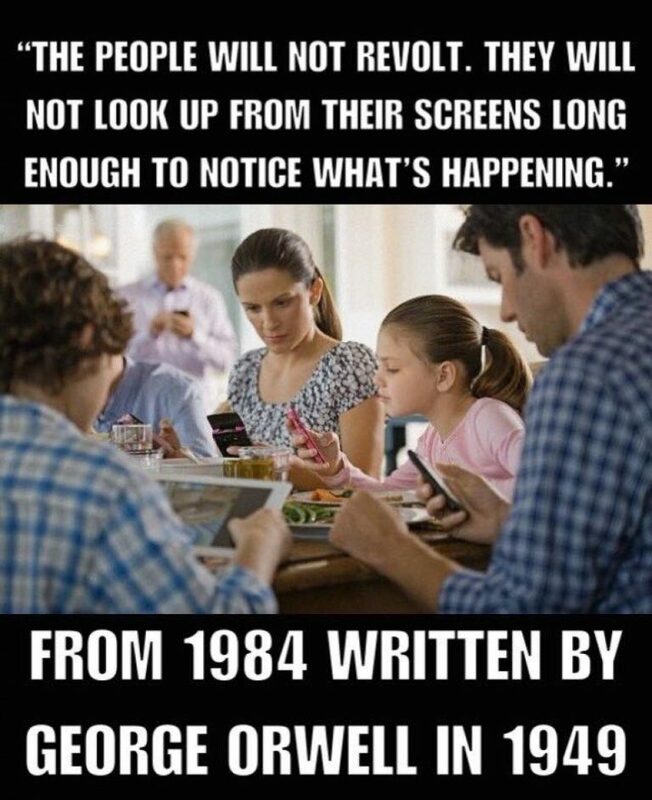 The reference to people looking up from their screens is a giveaway, since Orwell's telescreens were on the wall, like today's flat-screen TVs. Whoever adapted it changed it to make it into a reference to smartphones. I pointed this out to the friend who'd posted it. Though she didn't get pissy over the correction, she replied that she hadn't checked the accuracy of the quote, she just posted it because she "liked the sentiment." While the attribution is not unimportant, it's more important to me that the sentiment is bogus. The Internet, cell phones, and social media have often been used to organize resistance to unjust systems: from the Sanctuary movement to the Arab Spring to Occupy to the movement that helped bring down President Park in South Korea this year. True, many people just watch cat videos and such, but if they didn't have smart phones they'd be watching soap operas or reading Harlequin Romances and dime novels, or playing Candy Crush, or going to bear-baiting and public floggings. Many people probably watch cat videos, etc. and organize to smash the state; they're not mutually exclusive. I don't mean to exaggerate the extent to which people use electronics for activism, let alone to celebrate social media as "new forms of language production" that will turn us all into awesome post-human cyborgs. I have no idea how much screentime is spent on political activism compared to celebrity watching, or what the proportion ideally ought to be. My point is just that people are responsible for the uses to which they put their phones and their social media. Many people aren't happy about that thought, of course: they have their priorities, following college and pro football trumps informing themselves. But most Americans have never had much interest in informing themselves. And don't forget that governments don't regard smartphones and social media as the opiate of the people: that's why we have mass surveillance of these media, shutting down Internet access when the natives get restless, etc. Our rulers and owners would be happier, it's true, if people were as passive and manipulable as this meme pretends; and that's one reason for smug top-down propaganda like this -- which is obligingly spread by people who fondly believe they're better than the brainwashed Sheeple. The friend who shared it is apparently a Democratic loyalist; I doubt she was bothered by Barack Obama's attempt to harness the Internet to keep activism against his policies in check, or by the vacuousness of much of the liberal #Resistance to Trump's election. (We've known each other for a couple of decades, but didn't become friends on Facebook until the past few weeks. What she has posted in that time has been consistent in its politics, so it's probably better for both our blood pressure that we weren't friends during the 2016 election campaign.) I'm going to make a meme of my own using a photo of a bunch of young people staring at their phones: there will be a thought-bubble coming from each one's head, as they think: "Gee, I'm glad I'm not shallow and stupid like all these dumb people who never look up from their screens!" I just read The Leopard, by Giuseppe Tomasi di Lampedusa (1896-1957). Originally published in Italian in 1958, it was promptly made into a prestigious epic motion picture by Luchino Visconti, with Burt Lancaster as the lead. I decided to read the book before I watched the film, but now I wonder if I should follow through on the latter. For one thing, I generally dislike dubbing, and the original version had Lancaster dubbed into Italian; a shorter version made for US release apparently has Lancaster's own voice speaking English, but I presume everyone else is dubbed. For another thing, I suspect Lancaster was miscast physically: his character, Prince Fabrizio Corbero di Salina, has a "vast expanse of" belly under "his waistcoat" (7),* which doesn't sound like Burt. Not that he was fat; just very large and very strong; in houses inhabited by common mortals his head would touch the lowest rosette on the chandeliers; his fingers could twist a ducat coin as if it were mere paper; and there was constant coming and going between Villa Salina and a silversmith's for the mending of forks and spoons which, in some fit of controlled rage at table, he had coiled into a hoop. But those fingers could also stroke and handle with the most exquisite delicacy, as his wife Maria Stella knew only too well; and up in his private observatory at the top of the house the gleaming screws, caps, and studs of the telescopes, lenses, and "comet finders" would answer to his slightest touch [7-8]. I find myself picturing someone more like John Goodman, if the actor must be American. I don't quite believe any Hollywood actor, especially of that era, could play such a character convincingly, especially amid a mostly Italian cast. But the main reason I'm now reluctant to watch the movie is that Lampedusa's prose (as translated, quite beautifully, by Archibald Colquhoun) carries the book. It hasn't much of a plot, though I can understand why the vivid descriptions of people (aside from the Prince, his future daughter-in-law is described so sensuously that even I wanted to caress her), food, buildings, and Sicilian landscapes would have tempted Visconti. Everyone who writes about the film mentions the forty-minute-long ball scene, based on the one in the book, which I'm sure will be visually gorgeous, but I doubt it can convey Lampedusa's voice and tone. That's always a problem with omniscient narrators, which is why every film or TV adaptation of Jane Austen I've seen falls flat. Austen's on my mind right now because, inspired by a book group discussing Pride and Prejudice on the bicentennial of her death, I'm rereading all her work. Film and video can give you the costumes, the landscapes, the architecture and the decor, which, along with Colin Firth in a wet shirt, are what most people take to be what these stories are about; it's much harder for them to convey the author's attitude to his or her story. In fact with his low forehead, ornamental tufts of hair on the temples, lurching walk, and perpetual swelling of the right trouser pocket where he kept a knife, it was obvious at once that Vincenzino was a "man of honor," one of those violent cretins capable of any havoc . The more of them he saw the more he felt put out; his mind, conditioned by long periods of solitude and abstract thought, eventually, as he was passing through a long gallery where a populous colony of these creatures had gathered on the central pouf, produced a kind of hallucination; he felt like a keeper in a zoo set to looking after a hundred female monkeys; he expected at any minute to see them clamber up the chandeliers and hang there by their tails, swinging to and fro, showing off their behinds and loosing a stream of nuts, shrieks, and grins at pacific visitors below. Curiously enough, it was religion that drew him from this zoologic vision, far from the group of crinolined monkeys there rose a monotonous, continuous sacred invocation. "Maria! Maria!" the poor girls were perpetually exclaiming. "Maria, what a lovely house!" "Maria, what a handsome man Colonel Pallavicino is!" "Maria, how my feet are hurting." "Maria, I'm so hungry, when does the supper room open?" The name of the Virgin, invoked by that virginal choir, filled the gallery and changed the monkeys back into women, since the wistiti of the Brazilian forests had not yet, so far as he knew, been converted to Catholicism. Slightly nauseated, the Prince passed into the next room, where were encamped the rival and hostile tribe of men ... Among these men Don Fabrizio was considered an "eccentric"; his interest in mathematics was judged almost a sinful perversion, and had he not been actually Prince of Salina and known as an excellent horseman, indefatiguable shot, and tireless skirt chaser, his parallaxes and telescopes might have exposed him to the risk of being outlawed. But he was not talked to much, for his cold blue eyes, glimpsed under their heavy lids, put questioners off, and he often found himself isolated, not, as he thought, from respect, but from fear [222-3]. Lampedusa wrote about his era in retrospect rather than from within it, as Austen wrote about hers. The social worlds of balls, crinolines, hunting, palaces, are very similar, though fifty years after Austen, the Prince knows that the order he represents is in decline. If she had lived a century later, and felt free to write about sexuality and politics (most of The Leopard is set in the mid-1800s, during Italy's transition to a unified "modern" state, and several of its characters play significant roles in that transition), and if she had lived long enough to write about old age from experience, Austen might have produced something like The Leopard. But Lampedusa did produce it, and I'm very glad to have gotten around to reading it at last. *Quoted from the 2007 edition published by Pantheon Books.